It seems to me pretty obvious that nowadays it’s far easier to stage a successful Hamlet or Three Sisters than a successful Aida or Siegfried. And one reason is equally obvious: finding an actor to play Hamlet or Masha is no problem; finding a dramatic soprano for Aida or a Heldentenor for Siegfried is difficult to impossible. 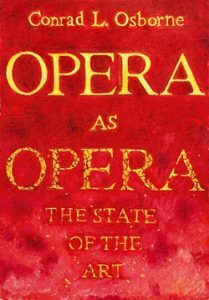 At the heart of Conrad L. Osborne’s Opera as Opera – the new, self-published mega-book that (as I wrote in The Wall Street Journal) surpasses all previous English-language treatments of opera in performance – is a complex argument exploring the less obvious reasons that theater lives and opera dies. Osborne encapsulates the differences in a single unforgettable sentence: “For a shining moment, opera seized the torch of orality’s failing hand.” That is: grand opera, a nineteenth century genre that flourished for something like a hundred years, grandly retained the rhetoric and gesture of poetry and drama – a grandiloquence of delivery otherwise discarded as artificial. An actor orating “To be or not to be” has a range of choices: tempo, stress, pitch, articulation are all up for grabs. He can be declamatory or intimate. Not so the tenor singing “Celeste Aida” – it’s all composed into Verdi’s score. Osborne’s historical perspective drives many of his book’s insights and arguments – including an absolute condemnation of operatic Regietheater. That is: the present-day predilection to re-date or resituate or otherwise alter operatic stories, not to mention the further predilection to deconstruct, casting doubt on composers and characters, in Osborne’s opinion signifies a failure to reckon with the nature of the beast. As theater and opera are not the same thing, he insists, neither is Regietheater in theater and opera one and the same: opera’s distinctive pedigree yields distinctive challenges. He builds his case with such tenacious patience and detail that it at the very least strikes an urgent cautionary note. If my own perspective on Regietheater is less jaundiced, it’s because my first experience was exemplary. In the summer of 1977, the New York Times sent me to the Bayreuth Festival. It proved a charmed Bayreuth season. I experienced Patrice Chereau’s seminal Ring in its second year – when the irreplaceable Zoltan Kelemen was still singing Alberich (he died in 1979 at the age of 53). I attended Gotz Friedrich’s landmark Tannhauser, noisily premiered in 1972. And I attended the first performance of Harry Kupfer’s still remembered Flying Dutchman. The fourth Bayreuth production that summer, Wolfgang Wagner’s Parsifal, was a bland sequel to the famous abstract stagings of his late brother Wieland; it left no impression whatsoever. The first thing that amazed me about the work of Chereau, Friedrich, and Kupfer was the acting – better than any I had ever encountered attending opera in New York, San Francisco, London, Paris, or Munich. As for the directorial interpretations and re-interpretations of story and text – they felt wonderfully provocative, thoroughly refreshing. They were also, I would say, a natural emanation of twentieth century European trauma, which dictated new readings of the past. Though the US experienced no such twentieth century debacle as the Great War or Adolf Hitler, Regietheater eventually made the Atlantic crossing, as had serial composition – a comparable case of Old World aesthetic upheaval – some time before. I remember spending many hours debating the astonishing ways in which Patrice Chereau second-guessed Richard Wagner. He scaled down or contradicted the cycle’s heroic speeches and deeds –beginning with those of Wotan, whose scowling face, stalking gait, and grasping gestures layered his “noblest” utterances with duplicity. Among other things, Chereau’s critique suggested an expose of the Ring itself, of the alleged arrogance and fulsome rhetoric of its creator; he even dressed Wotan as Wagner. Both these moments, I might add, were complemented by Regietheater redatings: Mime’s wire-rim glasses and Alberich’s floppy coat resituated these characters in a drama tracking the sins of Wagner’s own industrial age. As for the Kupfer Dutchman that Bayreuth summer: he staged it as if fantasized by Senta. (It’s on youtube here.) This hallucination anchored a case study in schizophrenia, replacing Wagner’s legend of redemption through love. Theatrically, the main beneficiaries were Wagner’s blandly sketched secondary characters. Believably portrayed as unwitting perpetrators of Senta’s insanity, Daland and the sailors’ wives took on added significance. As for Erik – rather than a dull-witted plea, his pathetic cavatina became an act of compassion. “Don’t you remember the day we met in the valley, and saw your father leave the shore?” he sang, desperate to yank Senta back to reality. But the narrow expectations of Erik and her father were the problem, not the cure; in panic, she visualized the Dutchman as a defense. The subsequent trio, tugging equally in three directions, was transformed. Kupfer’s reconception did no favors for the Dutchman himself – I cannot imagine Hans Hotter submitting to enacting this opera’s title role as the figment of a deranged imagination. But Kupfer’s handling of musical content was an astounding coup. The opera’s riper, more chromatic stretches were linked to the vigorously depicted fantasy world of Senta’s mind; the squarer, more diatonic parts were framed by the dull walls of Daland’s house, which collapsed outward whenever Senta lost touch. In the big Senta-Dutchman duet, where Wagner’s stylistic lapses are particularly obvious, Kupfer achieved the same effect by alternating between Senta’s fantasy of the Dutchman and the stolid real-life suitor (not in Wagner’s libretto) that her father provided. Never before had I encountered an operatic staging in which the director’s musical literacy was as apparent or pertinent. Back in New York, the following season, the Met premiered its first adventure in Wagnerian Regietheater: a Dutchman piloted by Jean-Pierre Ponnelle. Ponnelle’s conceit was to recast the story as a nightmare dreamt by Wagner’s slumbering Steersman – a gratuitous revision which led, scenically, to something resembling a high school Halloween party. Even though the Met had Jose van Dam – a far better Dutchman than Bayreuth’s – I remember not a single detail of this mis-production. And the same is true of the Robert Wilson Lohengrin that Osborn skewers for eternity. Did Ponnelle read music? Does Wilson? I have no idea – but I gleaned no supportive evidence from their Wagner efforts at the Met. And this is one problem with Peter Gelb’s regime. When Rudolf Bing took over in 1950, he imported notable stage directors – Alfred Lunt, Margaret Webster, Peter Brook, Garson Kanin – rather than engaging directors trained in opera. The idea was to blow some fresh air into an old house. How that worked out I do not know. But the results of engaging Robert Lepage to direct the Met Ring on the strength of his prowess for special effects are by now notorious. In act three of Siegfried, Wagner furnishes what may be the most psychologically complex love duet in all opera. In terms of stage action, nothing happens. To choreograph this duet – to block the singers – requires, I would say, detailed comprehension both of text and of musical structure. Lepage simply has Siegfried and Brunnhilde stand and sing. At a loss, he embellishes the duet with the Magic Fire that Wagner has specifically and poetically extinguished in order to create a magical stillness that Lepage cancels. I’ve had the pleasure of watching Dean Anthony rehearse young singers every summer at the Brevard Music Festival. All four Anthony stagings I’ve encountered there – Sweeney Todd, Rigoletto, Street Scene (cf this blog), Britten’s Midsummer Night’s Dream – have more than worked. The productions were packed with brave directorial details – but they took the form of Violetta’s pause and Mime’s shrug. And they were musically informed. Dean Anthony came to opera-directing after a distinguished operatic career as a character tenor, assaying a wide variety of repertoire in several languages. He also trained as an actor, dancer, acrobat, and tumbler. (Kupfer and Friedrich were trained to direct opera by Walter Felsenstein — whose influentially revisionist Komische Oper receives a detailed report card from Conrad L. Osborne). That’s a more promising cv, I would say, than directing Broadway musicals or Las Vegas circus spectaculars, however successful. A good observation. It strikes me that this could be why new chamber opera is thriving artistically in a way that new grand opera is not. Opera is far from being a dead art form . The stories it deals with are universal and eternally relevant and audiences still find them compelling even if directors sometimes come up with perverse productions . I’m very curious to read Osborne’s new book . I’m sure it will be a fascinating and thought provoking read even though I will disagree with many of his assertions . I’ve been corresponding with him by email for some time and I’ve been respectfully disagreeing with him and his replies have always been gracious . However, I don’t agree with you about the recent Met Ring, which I found both dramatically and visually compelling despite its undeniable imperfections . Met productions I’ve seen in recent years under Peter Gelb have not been perfect by any means , but some of them have been superlative from both a dramatical and musical viewpoint . As good or better than many productions I’ve seen from the past . I don’t believe that “opera is in decline “. In fact, it’s evolving, just as it has from its beginning approximately 400 years ago in Italy . Opera no longer has the seemingly social relevance it once had ,it has outlived its time. It is not evolving as mush as it is hanging on for dear life .